Since Russia’s attack on Ukrainian ships and capture of 24 sailors on 25 November 2018, Ukraine has been trying to receive international recognition for the captives being prisoners of war. The PACE resolution 2259 (2019) adopted on 24 January 2019 did not explicitly say the sailors are POWs. But by calling upon Russia to treat them in accordance to provisions of international humanitarian law such as the Geneva conventions it indirectly gave them this status, as the Geneva Conventions established humane rules of war. Particularly, the third Geneva Convention of 1949 established the basic rights of wartime prisoners. Euromaidan Press talked to lawyer Nikolai Polozov, who is leading the efforts to free the 24Ukrainian captives, about the meaning of the PACE resolution and the strategy of their legal defense. expresses “great concern” over Russia’s construction of the Kerch bridge to occupied Crimea and detaining of Ukrainian ships, supports the European Parliament proposal on extending the OSCE mission to the Azov Sea and the German and French proposal to have third-country observers monitor freedom of navigation in the Kerch Strait. The resolution was adopted with 103 votes in favor, 3 MPs were against and 16 abstained. One of the key debates in the days prior to the resolution had concerned the status of the 24 Ukrainian sailors whom Russia had after attacking on 25 November with artillery captured and taken from Crimea to Moscow, where they are in pretrial detention untill April. At least three sailors are wounded. A Ukrainian amendment to provide the sailors with POW status was put forward. From left to right: lawyer Nikolai Polozov, relatives of Ukrainian sailors captured by Russia Olga Grytsenko and Viktor Soroka, PACE President Liliane Maury Pasquier, human rights activist Maria Tomak, special representative of Ukrainian Ombudsman’s office Oleh Trokhymenko. One of the meetings was with Andreas Nick, the German rapporteur for the resolution. During it, a compromise was reached: the resolution would invoke the Geneva Convention but would not call the sailors POWs. The position of Andreas Nick was that the term “POW” would be counterproductive to the quick release of the sailors (read: it can irritate Russia). Lawyer Nikolai Polozov did not agree. According to Mr. Polozov, who had earlier defended the interests of Ukrainian political prisoners Nadiya Savchenko, Hayser Dzhemilev, Ilmi Umerov, and Akhtem Chiygoz, and had after the Azov Sea attack been chosen to coordinate the work of the group of 26 lawyers defending the Ukrainian sailors, it is precisely the POW status that will ensure the quickest possible release of the sailors. “We understand that the release of the sailors, as the decision to release the Ukrainian political prisoners held in Russia, depends on the decision of one person – Vladimir Putin. It will be a political decision, not one based on legal proceedings,” Mr. Polozov told Euromaidan Press. In order to increase this political price, Ukraine and the West should act as a single front, according to the lawyer. By calling things by their proper names – an armed conflict as an armed conflict and POWs as POWs, the chances of Russia releasing the sailors rise, both in the case of a positive scenario (international negotiations leading to agreements to release the captives), and a negative scenario (leading to additional sanctions against Russia). “Russia has ratified the Geneva Conventions, and whether it likes it or not, they clearly apply here. There was an armed conflict which started and ended on 25 November. 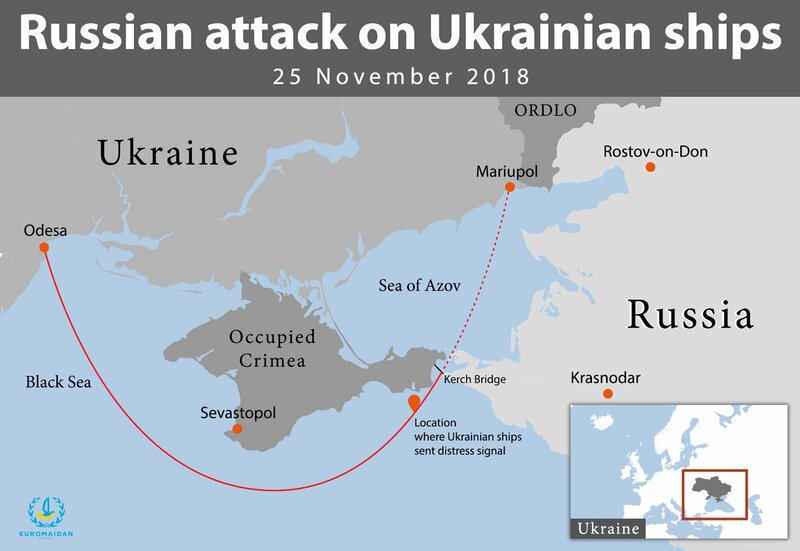 This was the first open act of military aggression of the Russian authorities, without them hiding behind military personnel on so-called ‘vacation.’ Ships under the Russian military flag attacked Ukrainian ships, and, remarkably, did so in international, neutral waters. Russia is violating this very Convention, says Nikolai Polozov. POWs should not be judged in civilian courts and kept in civilian pretrial detention facilities. They should not be deprived of their military uniform and insignia, and should be kept as a group. Finally, wounded POWs should be given medical treatment. According to Viktor Soroka, father of wounded sailor Vasyl Soroka, the sailors have not been given this aid. Their wounds are healing by themselves, shrapnel has not been extracted, the arm of one of the sailors is under danger of permanent disability and another sailor is under danger of losing his eyesight. “Putin doesn’t want to be called a war criminal. And basically, Russia is committing a war crime,” Mr. Polozov explained the importance of the POW status. Right now, the Russian authorities are treating the captured soldiers as ordinary criminals: they are accusing them of trespassing the Russian border in an organized group, despite the Ukrainian ships clearly having the right to free navigation in the Kerch Strait and Azov Sea and Russia selectively closing the strait to the Ukrainian convoy, despite an identical Navy convoy passing through the Strait in September 2018. The attack itself was clearly a Russian provocation connected to the upcoming elections in Ukraine, says Mr. Polozov. Since the Ukrainian arguments for considering the sailors POWs are clear but still has no international political backing, we asked Nikolai Polozov what the hold-up is about. “First, the attack took place at the end of the year, and since the political year was drawing to its end, the western political establishment did not manage to articulate its position and react in the necessary form. Yes, there was Trump’s statement, which elevated this decision to the very top. But in other places, we have to exert maximum efforts in order to bring the level of decisions to the top. The Americans and Europeans are afraid of hurried steps. If we don’t take Russian influence into account, they are afraid that according to the Geneva Convention, the exchange of POWs should take place after the end of the war or armed conflict. But they fail to understand that the armed conflict started and ended on 25 November, when fire was opened and ceased. Nobody wants to dig into norms of humanitarian law, it’s easier to simply declare them as ordinary detainees like the rest of the prisoners. This isn’t the case, and we are working to convince our western partners that the norms of the Geneva Convention should apply. Plus, the issue of the application of the Convention is a relatively new case, and with any new case, it takes additional efforts to understand it and to take adequate measures. They are afraid of taking risks following their political relations with the Kremlin and that’s why they are careful. Plus, we shouldn’t forget that the Russian authorities are actively working with European politicians and the establishment. I wouldn’t exclude some corruption moments,” said Mr. Polozov. Nevertheless, Mr. Polozov considers that the mention of the Geneva Convention in the PACE resolution is still a step forward, although a small one. Please write a letter to the imprisoned Navy sailor POWs! It goes a long way towards supporting their spirit.